Lucius Varro, a captain in the Fourth Army, is about to have the worst day of his life. Wounded and poisoned in battle, and fearing for his life and his future, he stumbles upon a plot that reaches deep into the past and the roots of everything in which he believes. Ironroot is set twenty years after the events of the first Tales of the Empire novel, Interregnum. Inspired by Roman history, this is an evocative and action-packed tale of treason and revenge, sure to delight fans of Conn Iggulden, Bernard Cornwell and Simon Scarrow. 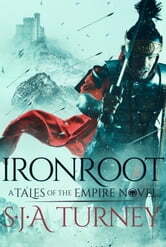 This new edition of Ironroot has been revised and professionally proofread by S.J.A. Turney’s publisher.